· Children and the state. Questions covered include: What is a child? Is childhood a uniquely valuable state, and if so why? Can we generalize about the goods of childhood? What rights do children have, and are they different from adults’ rights? What (if anything) gives people a right to parent? What role, if any, ought biology to play in determining who has the right to parent a particular child? What kind of rights can parents legitimately exercise over their children? What roles do relationships with siblings and friends play in the shaping of childhoods? How should we think about sexuality and disability in childhood, and about racialised children? How should society manage the education of children? How are children’s lives affected by being taken into social care? 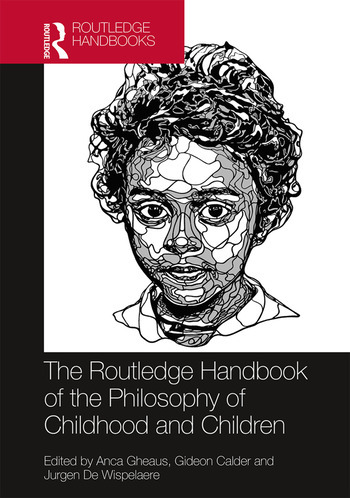 The Routledge Handbook of the Philosophy of Childhood and Children is essential reading for students and researchers in philosophy of childhood, political philosophy and ethics as well as those in related disciplines such as education, psychology, sociology, social policy, law, social work, youth work, neuroscience and anthropology. List of contributors. Introduction, Anca Gheaus. PART I Being a child. Chapter 1 Epistemology: knowledge in childhood, Fabrice Clément and Melissa Koenig. Chapter 2 Language and communication: evidence from studying children, M. J. Cain. Chapter 3 The science of the adolescent brain and its cultural implications, Suparna Choudhury and Nancy Ferranti. Chapter 4 Art and creativity, Jonathan Fineberg. Chapter 5 Philosophical thinking in childhood, Jana Mohr Lone. PART II Childhood and moral status. Chapter 6 The moral status of children, Agnieszka Jaworska and Julie Tannenbaum. Chapter 7 The value of childhood, Patrick Tomlin. Chapter 8 Childhood and well-being, Anthony Skelton. Chapter 9 Children’s rights, Robert Noggle. Chapter 10 Childhood and autonomy, Sarah Hannan. Chapter 11 Paternalism towards children, Kalle Grill. Chapter 12 The age of consent, David Archard. PART III Parents and children. Chapter 13 Reasons to have children – or not, Christine Overall. Chapter 14 The right to parent, Anca Gheaus. Chapter 15 The good parent, Colin Macleod. Chapter 16 Parental partiality, Jonathan Seglow. Chapter 17 The composition of the family, Daniela Cutas. Chapter 18 Parental licensing and discrimination, Carolyn McLeod and Andrew Botterell. Chapter 19 Ethical challenges for adoption regimes Jurgen De Wispelaere and Daniel Weinstock. Chapter 20 Gender and the family, Amy Mullin. Chapter 20 Filial duties, Diane Jeske. PART IV Children in society. Chapter 22 Childhood and race, Albert Atkin. Chapter 23 Childhood and disability, Gideon Calder and Amy Mullin. Chapter 24 Childhood and sexuality, Samantha Brennan and Jennifer Epp. Chapter 25 Children and animals, Sue Donaldson and Will Kymlicka. Chapter 26 What’s wrong with child labor? Philip Cook. Chapter 27 The vulnerable child, Mianna Lotz. PART V Children and the state. Chapter 28 Childhood and the metric of justice, Lars Lindblom. Chapter 29 Children and political neutrality, Matthew Clayton. Chapter 30 The costs of children, Serena Olsaretti. Chapter 31 Schooling, Gina Schouten. Chapter 32 Children and the care system, Gideon Calder. Chapter 33 Children and health, Havi Carel, Gene Feder and Gita Gyorffy. Chapter 34 Children and the right to vote, Ludvig Beckman. Chapter 35 Children, crime and punishment, Christopher Bennett. Chapter 36 Children and war, Cecile Fabre. Index. Anca Gheaus is a Ramon y Cajal researcher at the Universitat Pompeu Fabra, Spain. Gideon Calder is Senior Lecturer in Social Sciences and Social Policy at Swansea University, UK. Jurgen De Wispelaere is Political Economy Research Fellow with the Independent Social Research Foundation (ISRF) and a Policy Fellow at the Institute for Policy Research, University of Bath, UK.